You will learn about the securing function with decorative stitches, temporary altered memory, satin stitching, pattern functions, balance, memory and combi-mode, alphabets and more! Supplies need for class: For all Workbook New Owner Classes, you will need to bring your machine, all accessories (except embroidery), bright colored-good quality thread, power cord, and foot control. Don't forget to bring your printed copy of Workbook 2 to class! 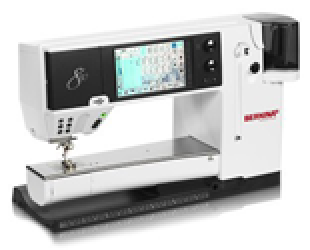 There is no class fee if your Bernina was purchased from Bear Patch Sewing Center. Class fee is $125 for other participants. Reservations are required for all classes. Please call 651-429-6500 to reserve your spot. Please be courteous- if you cannot attend the class you are registered for, please let us know as soon as possible. If you anticiapte being more than 10 minutes late for a class, please call to reschedule. Thank you! Classes should be completed within the first 90 days of purchase. However, we will offer you free classes for up to 1 year from purchase date. All new owners must take Workbook 1 first. The other Workbook classes can then be taken in any order.